This is the most direct solution. 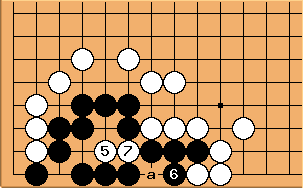 and reduces black's liberties and forces and to capture the four white stones. Although black wins the capturing race, the resultant eye shape is a farmer's hat, which is killed by . is yet another solution. After , if black plays at a, black puts himself into self-atari. It is also possible to reverse the order of and . After , directly occupies the vital point. Even when desperately tries to create the second eye, is an atari on four black stones including . Now if black connects at a, then he dies in gote. 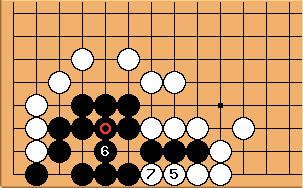 If was a black stone, then in Solution 2, it is not possible for white to play at a. However, directly kills. and are now miai. 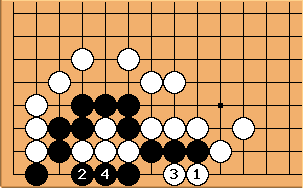 In the end, whether is a white stone or a black stone, we still have at least two solutions. What I had wanted to illustrate in this problem is the technique in Solution 1, which is to force black to capture the white stones and thereby reducing his eye space into one of the killable eye shapes.